Back-friendly products - Sitting - Office chairs - Aktion Gesunder Rücken (AGR) e.V. With the office chair we differentiate between the movement promoting active office chair and the back friendly standard office chair. The standard office chair therefore belongs to the "healthy basic furnishing" that must not be missing in any office and which should fulfil at least the following criteria. Performance ability and working conditions are directly associated! Our health and performance ability highly depend on the good design and appropriate use of the office chair. For example body postures that are assumed for any reason have effects on our thinking and perceptual processes (cognition), such as for example the decision formation or our attitude, and of course also on the emotionality. The back friendly standard office chair therefore has intuitive operating elements with which the sitting height and depth can be easily adjusted to the individual requirements. Furthermore, manufacturers bring much healthy movement to workplace with their office chairs. Seat and backrest are equipped with a synchronous mechanism and automatically follow the movements of the body. The synchronous mechanism combines a backward movement of the backrest with a lowering of the sitting surface in the back area that is adjusted to it - meaning a change of the opening angle. This finally leads to more comfortable sitting in reclining posture. 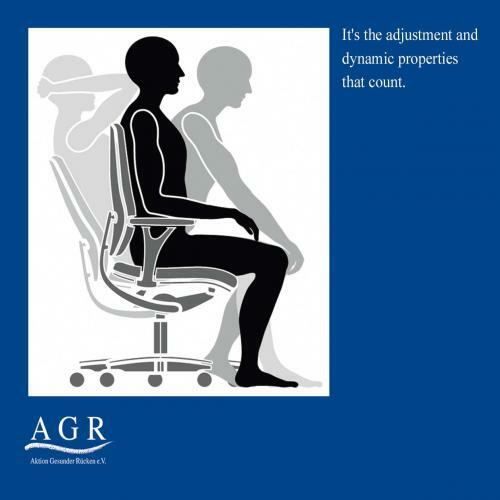 In addition all AGR tested standard office chairs have an effective downward suspension that ensures shock absorption when sitting down and thereby prevents spinal column compression. The sitting surface with integrated free-flowing, respectively forward adjustable seat inclination can also be individually adjusted in the depth. Height, width and depth adjustable armrests ensure relief of the shoulder and arm muscles (especially important with intensive work at the monitor). Also an individually or automatically adjustable backrest pressure, a balanced support through a high backrest and much more belongs to the basic equipment with a back friendly standard office chair. A good office chair requires only a few but thereby functionally advantageous and well accessible operating elements. In combination with back friendly behaviour, e.g. frequent change of the working posture, this is an important prerequisite for health and performance ability at the office. The back friendly design of the entire workplace serves the employer and employee at the same time, which unfortunately is still not taken into account enough. A back friendly office chair alone is however not sufficient. The totality of the office workplace, meaning the environment, lighting conditions respectively illumination adapted to the work, the size of the office desk, arrangement of the screen etc. must be considered and adapted to each other. Combined standing seat workplaces or an additional high desk represent an ideal supplement. Office chairs that are used at 24-hour workplaces such as control rooms must fulfil especially high requirements. On the one hand they must support an upright sitting position, allow changing sitting positions and optimum visual contact (viewing monitors) and on the other hand promote the necessary specific performance ability. Which is why these chairs must always also have an adjustable nape support. In addition, quality and robustness are important. Because they must also be suitable for individuals with high bodyweight and for the use in three shift operation. A synchronous adjustment of the sitting surface and backrest is important. These change the opening angle (angle between the sitting surface and the backrest) between both parts in a ratio that is in balance with the physiology. The rotation axis of the sitting surface must be as close as possible to the front edge of the seat so that it does not rise up when leaning back on the backrest. The opening angle between the backrest and the sitting surface must be at least 110° under exertion of force and with sufficient stability. The backrest must provide balanced support. So that the natural shape of the spinal column also remains preserved when sitting the chair must have an individually adjustable lordosis support, the backrest must however at least have an anatomically shaped backrest. The reclining pressure of the backrest must be individually adjustable or adjust automatically to the needs of different users. The user must have the feeling of having to overcome a resistance when leaning back (promotion of the muscle activity). This must be perceived as still being pleasant and not tiresome. The backrest should be as high as possible so that the thoracic spine is relieved when leaning back (minimum height: 45 cm from the sitting surface up to the upper edge of the backrest in the lowest position). Make sure that with permanent backrest contact the freedom of movement of the shoulder joints and arms is not impaired through the cushioning. The anatomically shaped sitting surface is intended to ensure that one also does not slip out of the seat when leaning back. A correct pelvis position is thereby supported. To accommodate to the different thigh lengths of the users an individually adjustable sitting surface depth is necessary, e.g. in the form of a sliding seat. Alternatively a nonadjustable sitting surface matching to the permanent user can be sufficient. Important: Between the knee joint and the front edge of the seat there should be a free space of 2-3 finger widths to ensure the circulation for the legs. The sitting surface must be able to be inclined forward slightly. The chair must have a shock absorber for the sitting surface – also in the lowest sitting position – to protect the spinal column against compression when sitting down (sitting depth suspension). All operating elements must be easily understandable, easily accessible, functional, ergonomically designed and be easy to operate. A good standard office chair must have height adjustable armrests - only in exceptional cases should these be dispensed with. They support back friendly sitting down, respectively standing up and partially relieve the shoulder girdle muscles. In addition to this it is an advantage if the armrests can be adjusted in the width and depth so that the lower arms can be comfortably rested on them. Swivelling armrests optimise the arm support with movements going beyond the width of the chair and with slightly spread arms in the work posture. Sitting furniture that is used at 24-hour workplaces must fulfil very high requirements. The chair must support the spinal column, must allow changing sitting postures and optimal visual contact to the monitors and promote the necessary specific performance ability. Due to the activity (observation of the monitors) a height and inclination adjustable nape support, a high backrest (at least 58 cm) and a larger opening angle are necessary. In addition with 24 hour continuous use the chair must also be suitable for high body weights. All the technical solutions in the world cannot help if they are not put to good use and the chair is not adjusted to the individual needs of the user. Please therefore make sure you are familiar with the possible settings provided by your office chair. The manufacturer's instructions for use will help you. Good manufacturers and good retailers even offer their customers personal instructions and training. If you sit incorrectly for long periods of time, bending over or in a twisted position, this will hamper your breathing and digestion. Sitting poorly can cause premature fatigue, circulatory disorders or indigestion and backache, resulting even in more serious musculoskeletal diseases. Make good use of the whole seat: this is the only way to warrant supportive contact to the backrest. Adjust the seat height to exactly the right level: the elbows should have an angle of about 90° with the lower arms flat on the working surface. The knees should also be bent at 90° when the feet are flat on the floor. You will need a footrest if the working surface is too high and cannot be lowered any further. The footrest should have a non-slip surface and be at least 45 cm wide and 35 cm deep, with adjustable height and tilt. Adjusting the backrest: the curve of the backrest should support the spinal column in the area of the 3rd and 4th lumbar vertebrae on the level of the iliac crest. Dynamic sitting means frequently changing the sitting position. The mechanism should never be locked. This ensures that many different demands are made of the muscles, keeping them trained. Some office chair concepts permit changing sitting positions right through to a lying position. These office chairs stand out with a very large opening angle that even permits a so-called relaxed position. A few years ago, it would have been simply inconceivable to be lying down while working in the office. Not just because our office work would not have permitted this position but also because society simply didn't accept lying down as a possible position for working in the office. But today a lot can be down in a lying position with no great effort, using a mouse click, voice input or mobile touchscreens. It is not just the body that benefits from a lying position but also the mind as well. Findings from sleep research confirm for example that power napping while lying down demonstrably improves work performance and well-being. Those who integrate power napping in their life rhythm are verifiably more concentrated with faster responses and better performance levels as well as being more balanced, than those who prefer to manage without a horizontal intermezzo during the day.